scheduled for construction...more on this and the other projects below. On 15 February 2019, the budget bill that finally passed to end the US government shutdown included the fiscal 2019 NSF budget...and this included $103 million to begin work on "renovations to its facilities in the Antarctic" (otherwise known as AIMS) initially at McMurdo, per this 15 February AAAS Science news article. That bill also directs NSF to pay for the McMurdo modernization from this account rather than its research account. Other announcements include the 26 February NSF press release and the Future USAP announcement which describes AIMS as a 10-year undertaking. And in a further look to the future, while the president's 2020 budget proposes deep cuts to NSF's funding, the budget proposed by NSF includes $98 million for the second year of the five-year AIMS project (!? ), per this 19 March AAAS Science news article. In any case, the project is underway. The overall project has been discussed extensively by me on this site and by the Future USAP site, so on this page I'll concentrate on what is happening now and in the more immediate future. The AIMS project consists of four major components as depicted above--the largest of course being the Core Facility which will initially wrap around Building 155. This facility will be constructed in three phases. The first of these will probably be the "Central Services and Warehouse" which also includes the galley, lecture hall, office space, and a chapel...construction of it may begin in 2021-22. The other two phases--Contingency/Emergency Operations (which includes the firehouse and medical as well as the gym and club/lounge areas)--and the field science support/trades shop phase, will be constructed in turn. The other three AIMS components include the VEOC pictured at the top of this page, berthing, and supporting utilities throughout the station including a new ~65,000 gallon water storage tank and associated pumphouse. All of the AIMS components except for utilities are design-build, meaning that the contractor needs to complete the design from the 35% submittals presented during the procurement process. 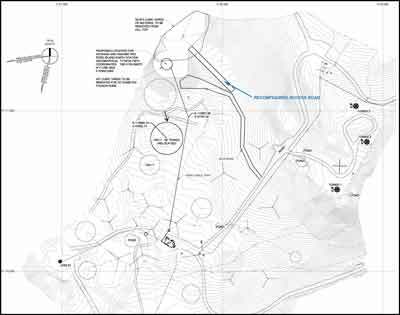 The utilities work will be design-bid-build, and some of the utilities, site, and demo work will be conducted directly by Leidos/PAE etc. As AIMS was initially funded only in February 2019, procurement may be just beginning, with the first significant materials shipments perhaps on the January 2020 vessel. 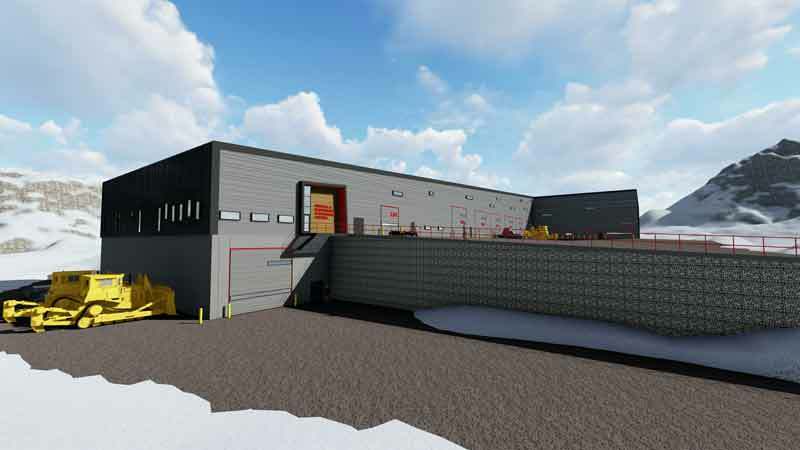 The VEOC pictured above will be one of the first AIMS projects underway, as it is intended to serve as the AIMS contractors' equipment workspace during the project, while the existing VMF continues to support current station operations. While the photo might indicate that the VEOC is smaller than the VMF, it is in fact significantly larger, with 9 heavy equipment bays and a tire bay on the main level along with office, shop, and warehouse space. The lower level is primarily an equipment wash bay. Below...two examples from the 2018-19 season of why the AIMS contractors will need a separate building to maintain their equipment. Here's a brand new Caterpillar 323 excavator being towed into town from the Phoenix Airfield. It's on rent for 12 months from Gough Cat (Gough Cat photo). 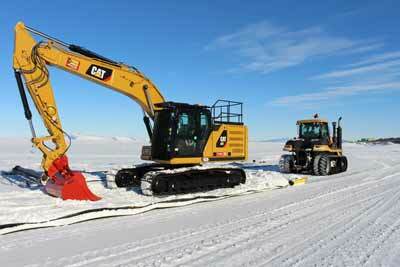 Here's a used D-8 on its way to McMurdo, also on rent. Not sure from whom, but this photo is from Olivia Thomson. Of interest is the fact that, based on the geotechnical investigation, the VEOC will be constructed on competent soil and rock, so the preliminary design has its lower floor slabs as precast on grade; the slabs as well as the footings will be underlain by geofoam. In contrast, the core facility components have elevated lower floors with precast footings; however most of the floors themselves will be cast-in-place concrete topping slabs above either precast hollow planks or steel Q-decking. 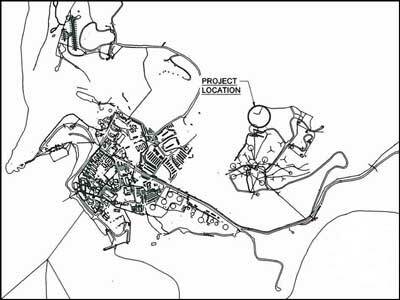 The other two AIMS projects due to begin first are the utilities work (continuing what is already underway) and the first phase of "lodging." 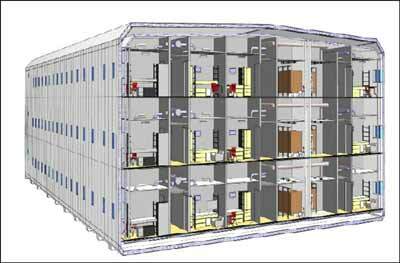 This is to be a single 3-story structure housing 285 people in a combination of 201 single rooms and 42 double rooms. The original 35% design depicted in the drawing at left was based on conventional construction methods, but it was subsequently determined that a modular building approach is preferred. This building will be uphill from the uppercase 206-209 dorms and will occupy the site of what is currently dorms 203-A, -B, and -C (formerly known as 203-205). 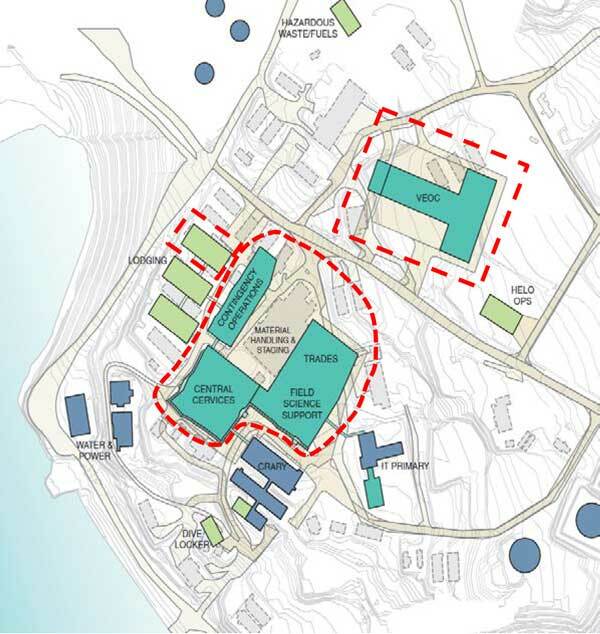 The original master plan called for retention of dorms 206-209 or at least their steel structures, the current plan calls for these to be replaced with two new similar 285-person dorms. There is also a contingency that the project could include a temporary modular dormitory housing 150 people during AIMS construction; it would be removed after project completion. Several projects are already underway that are NOT technically part of AIMS, as they were budgeted separately. One of these is the IT&C Primary Operations Facility. 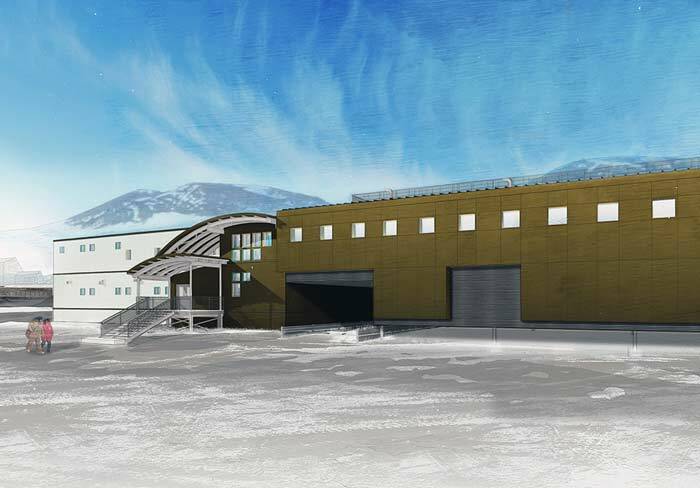 This is actually an 11,000 square foot addition to the existing Science Support Center (SSC), which will eventually be converted to the main data hub for McMurdo. 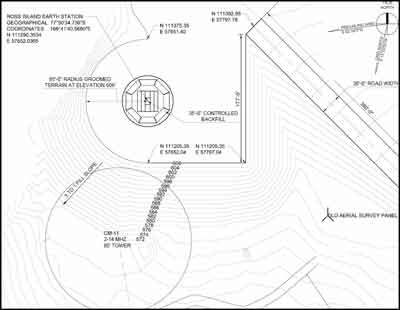 A conceptual view is seen below, and there is more info and credit here. 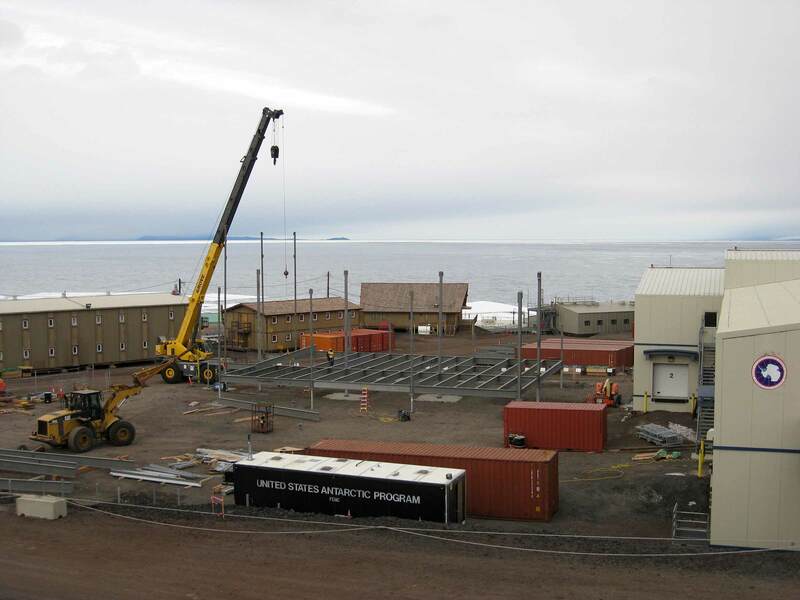 Construction of the "IT&C Primary" began in the 2018-19 summer with site work (right, a 13 January look at the site prep, taken from the USAP McMurdo webcam). 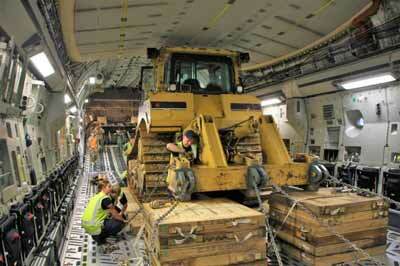 and setting of the precast foundations, which were delivered on the vessel along with the structural steel. 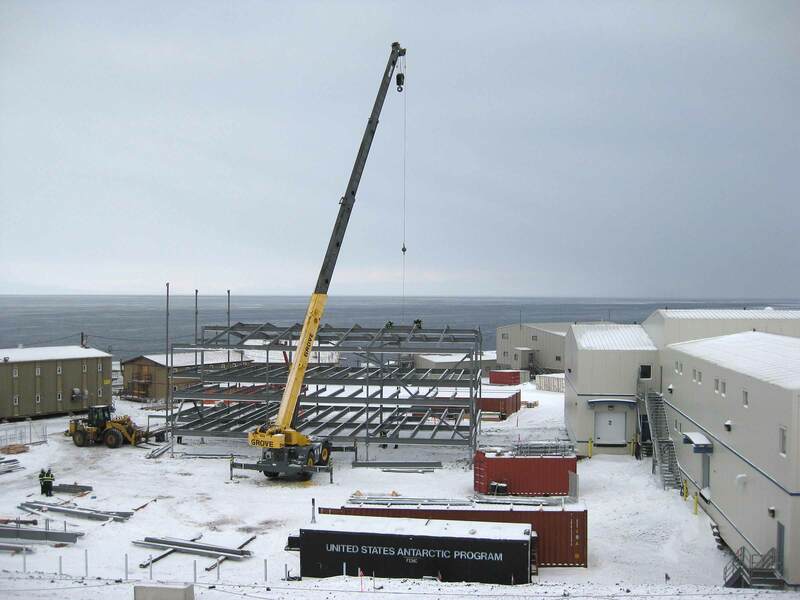 And at the beginning of February, steel erection began...by the Chattanooga, TN structural contractor Southern Spear Ironworks, which has been selected by ASC as the project's steel erection contractor for the entire McMurdo project. Fourteen ironworkers, welders, laborers, and others spent about seven weeks erecting the main steel before returning to Chattanooga on 22 March. Of note here is the fact that ASC is soliciting smaller specialty contractors to work on the project...which is the way construction usually works best, in my experience. The information about Southern Spear comes from this 24 March 2019 Chattanooga Times Free Press article with photos...which includes a request for companies or individuals looking for subcontract work or a job, as well as an earlier 23 January Times Free Press article about Southern Spear's selection for the project, which is being overseen by construction manager Parsons (their April 2018 press release). It quotes Southern Spear Ironworks company president and founder Sean Compton about the logistics difficulties--he points out that "there's no Lowe's in Antarctica." Below, several photos of the steel erection project and the current McMurdo webcam view of the site. A view of the steel erection on 24 February (photo by Ken Huston from the USAP photo library (link to original). And another look 2 days later (photo by Pedro Salom from the USAP photo library (link to original). This shows the rafter beams in place, on 11 March (photo by Pedro Salom from the USAP photo library (link to original). 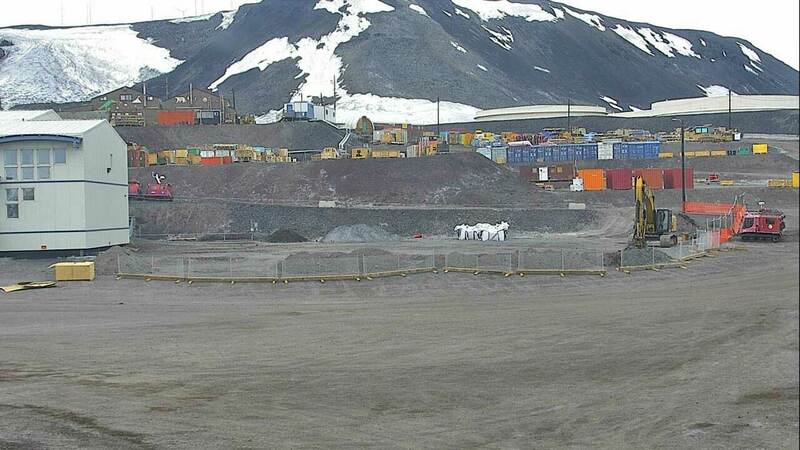 And here's a nearly live view from the McMurdo webcam (click here for the current view, then click the slide icon for an archive of the past 24 hours). 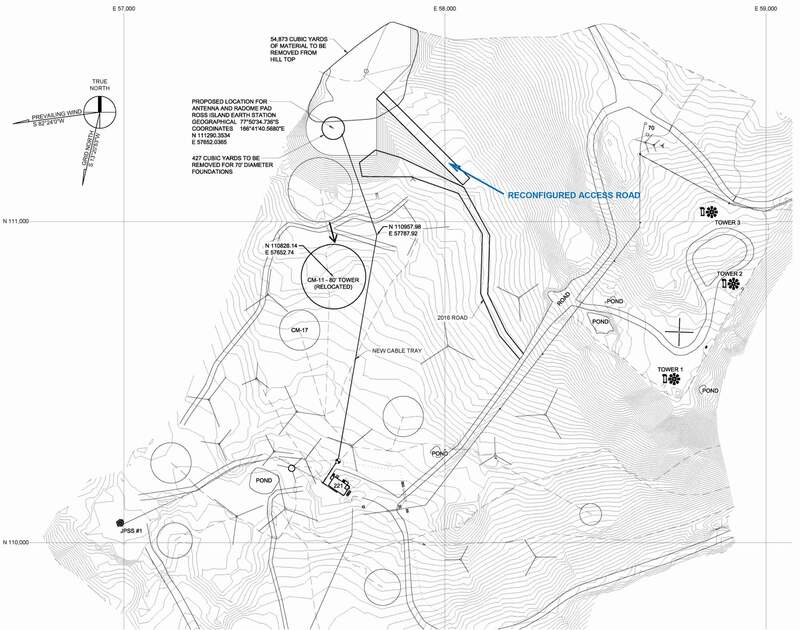 The general site location plan. Zooming in on the site location. A rock drill at work during the summer. 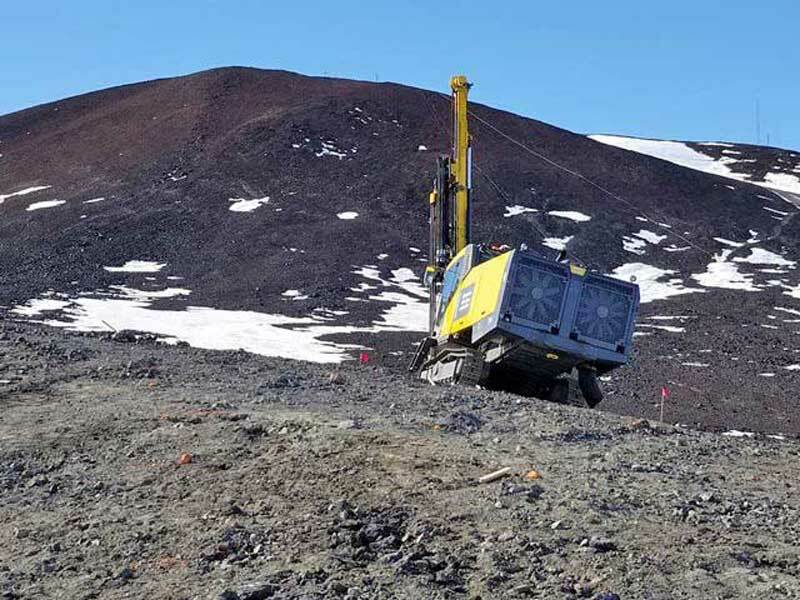 The effort during the 2018-19 season included leveling the hilltop site...drilling holes for explosive blasts and then clearing more than 55,000 cubic yards of material from about two acres of the site. 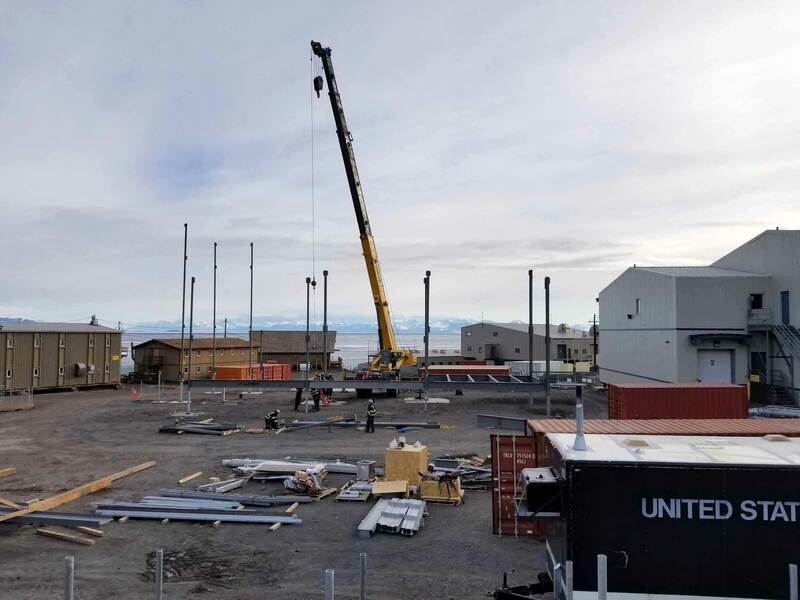 Additionally, some of the cable tray supports for power and communications were installed between the site and the existing T-Site building 221. 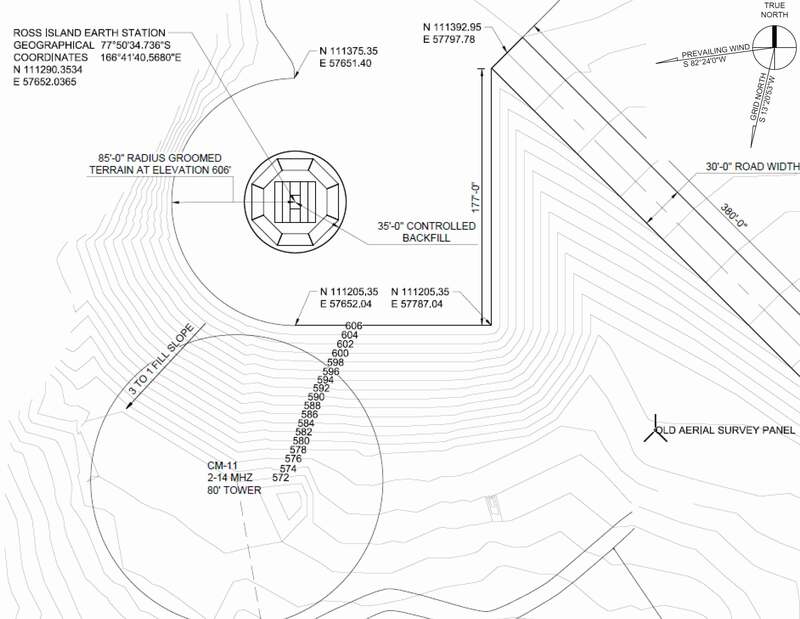 The earth station will eventually be connected to the "IT&C Primary." The antenna dish will look north to access satellites to be launched by a NOAA partnership which "includes the NOAA collaboration with the European Organization for the Exploitation of Meteorological Satellites (EUMETSAT). EUMETSAT will launch a series of enhanced satellites beginning in Fall 2021 that will outstrip the current capacity of the present BITF satellite communications infrastructure supporting the collaboration between NSF and NOAA." The antenna components arrived in McMurdo on the January 2019 resupply vessel. And more recently, in February 2019, DataPath, Inc. was awarded a prime contract from ASC/Leidos to provide software and integration support to the RIES project, per their 19 February 2019 press release. Most of the information in the previous paragraphs, including the three drawings above as well as significant additional details, appear in the RIES project environmental document submitted to the Antarctic Treaty Secretariat in December 2017 and available here, it is from the Antarctic Treaty EIA database. The photo of the rock drill at work is from David Huntsman. Another "pre-AIMS" project, underway but scheduled to ramp up and mesh with the AIMS project, is a component of preliminary utilities work to clear the way for some of the early construction. The original project "sources sought" solicitation was issued in May of 2017; it announced AIMS "Industry Days" (presolicitation conferences) in June and August 2017 at the ASC offices in order to publicize this project to prospective contractors (I attended one of these). It also stated that further solicitations would not be issued to the general public. It included this link to the draft solicitation documents including preliminary drawings, specifications, and details; most of these documents are still available. The VEOC preliminary drawing, outline site map, and lodging preliminary drawing seen above on this page are from the pre-solicitation conference slides.